This bloodtrail is 100% real. 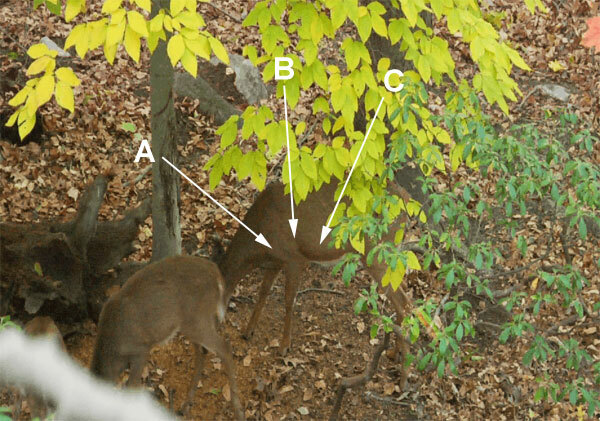 All the pictures and steps are as it happened during Pat Lefemine Jr's deer hunt in October, 2008. Good Luck! After successfully killing his first deer in Bloodtrail Challenge 25, my son Pat Jr. gets back in the stand to shoot a doe. We are hunting an urban property on a cull hunt where baiting is legal. There is only one home within 500 yards, however it is surrounded by a deer fence to keep wildlife out of the owners' yard. As in any urban bowhunt, shot placement is critical and getting a quick, clean kill is paramount. Still, things happen and when they do, your experience in trailing become critically important to keep from losing the deer and potentially giving bowhunters a black eye in the neighborhood. Armed with this background please begin the competition. No Blood Edition - This challenge does not contain traps or wordplay. It is, however, not exactly textbook as we have very little blood to go on so you will need to use intuition and knowledge based on several clues to find this doe. The stakes are high on this one. Play at your own Risk Have Fun, and NO WHINING! Please vote on the most likely choice after you are given each clue. Correct answers are awarded the maximum points. Note: there are many correct answers, but some are better than others. You need to be a registered Bowsite.com visitor to play and have cookies enabled. Your score will be held in the database until the 8th clue at which time we will post the final scores including the top 200 highest scorers for this competition. New clues will be presented daily. Choose the best shot from these choices?